The monthly bulletin of the State Board of Health for February is ready to be sent out. It contains the usual tables of the mortality statistics of the month by counties, geographical districts and by cities and towns. 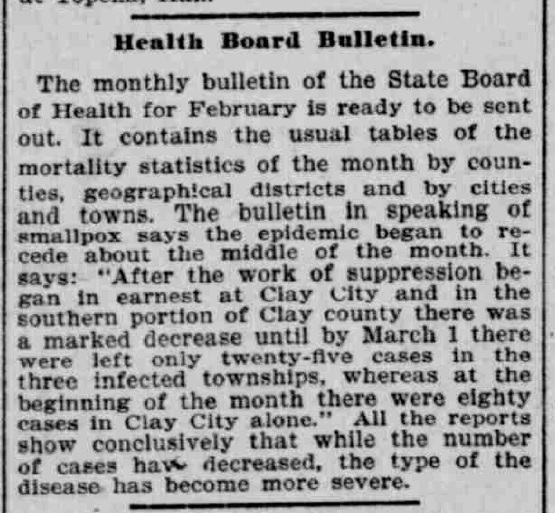 The bulletin in speaking of smallpox says the epidemic began to recede about the middle of the month. It says: “After the work of suppression began in earnest at Clay City and in the southern portion of Clay county there was a marked decrease until by March 1 there were left only twenty-five cases in the three infected townships, whereas at the beginning of the month there were eighty cases in Clay City alone.” All the reports show conclusively that while the number of cases have decreased, the type of the disease has become more severe. “Health Board Bulletin,” The Indianapolis Journal (Indianapolis, Indiana), 18 March 1900, p. 8, col. 3; digital image, Chronicling America (http://chroniclingamerica.loc.gov/ : accessed 6 December 2014). This entry was posted in 1900 Smallpox Epidemic, Clay County, Newspaper Clippings and tagged Clay City, Clay County, epidemic, Indiana, Indianapolis Journal, Smallpox, State Board of Health on January 28, 2015 by Deborah Sweeney.